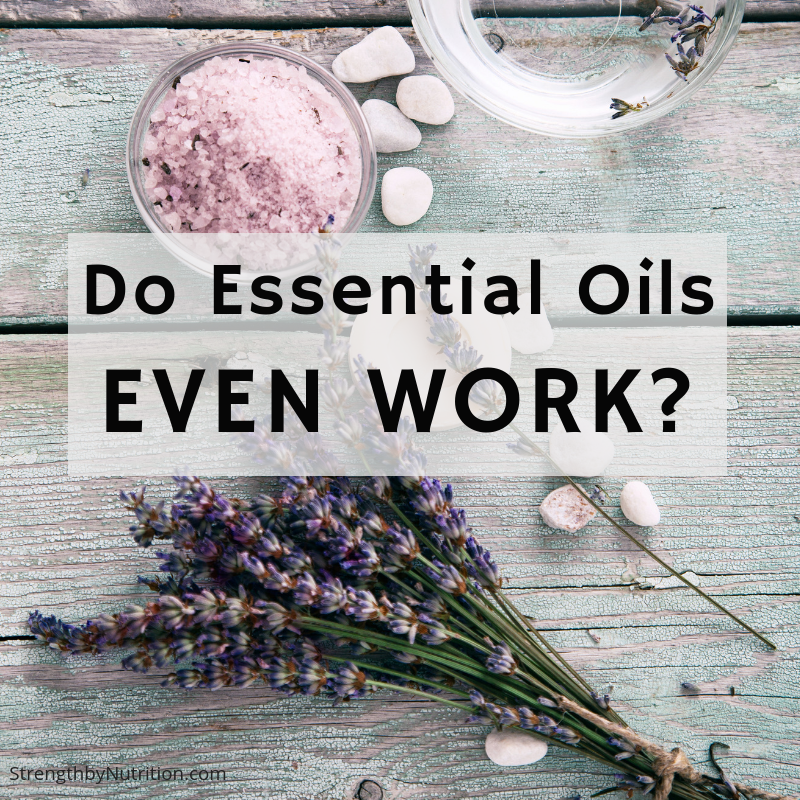 Do Essential Oils Even Work? This one is for all my chemistry and biology nerds out there! Sure I’m a nutrition and health coach now, but I actually graduated with 2 degrees in engineering. One in chemical engineering and the other in bio engineering. To say that I’ve been indoctrinated with Organic chemistry, biochemistry, microbiology, and physiology is an understatement. But that also explains why I am a little ‘slow’ when accepting ‘fad’ trends like natural products, essential oils, etc. However, I couldn’t ignore this trend any longer and wanted in on their secret….so I dove deep into the literature (and yes there have been MANY scientific studies and reviews on the efficacy and benefits of essential oils believe it or not), and have a hunch that they might actually work (aside from just smelling pretty). If you’re like me and super skeptical about essential oils, it may be worth a visit to our blog (link below) to read up on the chemistry of essential oils and, even further, how they interact with bacterial, fungal, and human biology to benefit us in modern life. In this article we are going to breakdown the top 3 beneficial properties of essential oils so you can decide if they are really worth the hype. Before reading this article, it may be worth reading about the organic chemistry makeup of essential oils here. “An important feature of essential oils (EOs) are their hydrophobicity, which allows them to partition into lipids of the cell membrane of bacteria, disrupting the structure, and making it more permeable. Although a certain amount of leakage of bacterial cells can be tolerated without loss of viability, greater loss of cell contents or critical output of molecules and ions can lead to cell death. carvacrol, eugenol, and thymol) were characterized by the highest antibacterial activity, followed by EOs containing terpene alcohols. Other EOs, containing ketones or esters, such as β-myrcene, α-thujone, or geranyl acetate, had much weaker activity, while volatile oils containing terpene hydrocarbons were usually inactive. These compounds are responsible for the disruption of the cytoplasmic membrane, the driving force of protons, electron flow, active transport, and also coagulation of cell contents. It is important to mention that essential oils are more active against Gram-positive than Gram-negative bacteria. The latter are less susceptible to the action of essential oils with the outer membrane surrounding the cell wall that restricts the diffusion of hydrophobic compounds through its lipopolysaccharide film. “The antioxidant potential of an essential oil depends on its composition. It is well established that phenolics and secondary metabolites with conjugated double bonds usually show substantial antioxidative properties. Most of the essential oils are dominated by oxygenated monoterpenes such as alcohols (Achillea filipendulina), aldehydes (Galagania fragrantissima), ketones (Anethum graveolens, Artemisia rutifolia, Hyssopus seravschanicus, Mentha longifolia, and Ziziphora clinopodioides), and esters (Salvia sclarea). The essential oils of cinnamon, nutmeg, clove, basil, parsley, oregano, and thyme are characterized by the most important antioxidant properties. Thymol and carvacrol are the most active compounds. Their activity is related to their phenolic structure. These phenolic compounds have redox properties and, thus, play an important role in neutralizing free radicals and also in peroxide decomposition. “Inflammation is a normal protective response induced by tissue injury or infection and functions to combat invaders in the body (microorganisms and non-self cells) and to remove dead or damaged host cells. The inflammatory response induces an increase of permeability of endothelial lining cells and influxes of blood leukocytes into the interstitium, oxidative burst, and release of cytokines, such as interleukins and tumor necrosis factor-α (TNF-α). It also stimulates the activity of several enzymes (oxygenases, nitric oxide synthases, peroxidases, etc. ), as well as the arachidonic acid metabolism. Melaleuca alternifolia EO was reported to have a considerable anti-inflammatory activity.This activity is correlated with its major compound: α-terpineol. The active compounds act by inhibiting the release of histamine or reducing the production of inflammation mediators. Geranium essential oil is another example. So there you have it – a critical review of the top three benefits of essential oils. Perhaps this was enough for you to validate spending $30 on a 15mL vial of lavender oil, or perhaps not – you get to decide. Thanks for reading and leave us any comments or questions below!